Our children are often hyper, moody, anti-social, anxious, sleepless and unfocused. 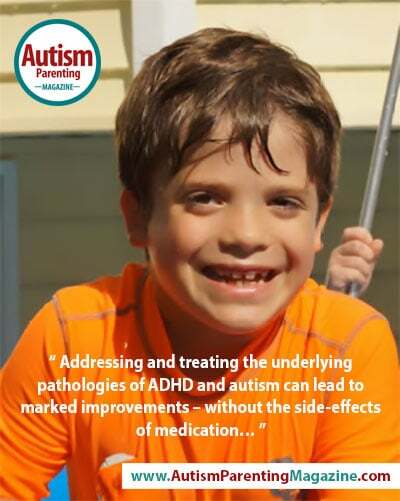 Traditionally, ADHD and autism spectrum disorders are diagnosed by psychotherapists such as myself, psychologists, and psychiatrists, who recommend traditional therapy and medications to address neurological symptoms. Parents are told that their child’s diagnosis is complex and multifactorial in nature; a result of genetic, psychological and others factors widely unknown. Most doctors are taught to treat the emotional and mental component of these disorders with medication. Yet, the physical or medical issues these children often share are rarely noted or discussed. Some of those include eczema, asthma, chronic illness, gastrointestinal distress, food sensitivities, yeast overgrowth, leaky gut syndrome, malnutrition, hypoglycemia, adrenal fatigue, hormone imbalances, and sleep disturbances. Additionally, proper testing also reveals high levels of heavy metal and environmental toxins relative to neurotypical children. Sadly, many conventional doctors have little to no experience in the area of nutrition and do not take a systems biology approach to treat their patients. Therefore, it becomes imperative to seek out an integrative neurologist, or naturopathic doctor to begin testing for and treating the underlying conditions. As we do so, we start seeing improvements in behavior, mood and attention. Our emotions are largely governed by the state of our immune and intestinal system. Interesting Fact: There are actually more neurons lining the digestive tract than in either the peripheral nervous system or the spinal column. This “second brain” is known as the enteric nervous system. Dr. Michael Gershon, chairman of the Department of Anatomy and Cell Biology at New York–Presbyterian Hospital/Columbia University Medical Center, an expert in the nascent field of neurogastroenterology, explains that ninety percent of the fibers of the vagus nerve in the neck carries information from the gut to the brain, and not the other way around. Interestingly, ninety-five percent of the body’s serotonin is found in the bowels. Dietary changes and protocols can seem overwhelming at first – so move slowly, but steady. Uncover, one piece of the puzzle at a time — so you know what is working. A good start is to eliminate artificial food coloring and preservatives from the diet. They contribute to a child’s attention, mood, focus, and sleep issues. For a long time, as a therapist I wondered about the cavalier prescribing of drugs but bit my tongue. Who was I to question physicians with the benefit of many more years of medical training? As my husband, Steve, and I tried to make do with physical and behavioral therapies, I received a medical journal article from my Aunt Joan about a link between malabsorption and malnutrition issues and autism spectrum disorders. This led me to wonder whether Evan’s disorders could be a medical illness treatable with natural remedies that didn’t involve intrusive, personality-altering medication. I started reading numerous medical journal articles and posts on the Internet from mothers who found alternative and natural treatments genuinely helpful. While I was skeptical at first, the potential rewards were so high that these methods outside the mainstream seemed well worth trying. I’m now so grateful that my husband and I did try. It has made all the difference in Evan’s health and well-being. We treated Evan with nutrition and biomedical methods. We starting taking advantage of the many Eastern Medicine therapies and treatments such as acupuncture, and energy healing, as well. I discovered that over the course of treatment Evan started improving exponentially in all areas of development, including, emotionally, socially, physically and academically. There was a tremendous jump in Evan’s expressive language and speech articulation; it is more complex and conversational. His comprehension skills were also improving. He began to formulate a thought and carry out his set of plans. He is now formulating new ideas and trying them out on others. At school Evan’s progress catapulted. He was able to stay on task and presented less careless. He had less difficulty listening and following directions, and no longer seemed to get as distracted by background noise. He began listening to his teachers and responding appropriately. He was able to retain information and speak more clearly to convey his ideas. Socially he was also doing much better. He began making eye contact more often and greeting his friends at the playground. Evan no longer detaches himself from the world. He talks to strangers in waiting rooms and has whole conversations. He is able to assert himself and tell people what he likes and doesn’t like and what he wants and doesn’t want. He is less anxious and no longer grunts and screams when he is upset. Evan is coping better with change of routine and with frustrating situations. In addition, his sensory issues all but disappeared. Evan’s fine motor skills have significantly improved and he is able to write his letters as well as many of his peers. He is also able to communicate clearly and express his thoughts and ideas in a sequential way. We now see a confidence little boy who is eager to join in group activities. His motor planning ability has jumped up from extremely disordered to barely noticeable. We noticed an increase in imaginative play and although not perfect there is a greater independence in daily activities of living. Medically we noticed that his sweet cravings lessoned and he was no longer overly thirsty. The dark bluish circles under his eyes disappeared. His eczema and fungal infections cleared. He has not been sick except for a few minor colds and has only missed a few days of school since starting the regime. He no longer suffered from chronic sinus infections, respiratory infections, or eye infections. His constipation issues continued to improve. He no longer suffered from nightly head sweats and the quality of his sleep has improved as well. So we continue with appointments with our holistic physicians to address any emerging health concerns or imbalances. We continue his dietary modifications and we continue with his therapies in order for him to catch up 100% in an effort to optimize his health. Jennifer Giustra-Kozek is a board-certified psychotherapist, speaker and author of “Healing without Hurting: Treating ADHD, Apraxia and Autism Spectrum Disorders Naturally & Effectively without Harmful Medication.” Jennifer has over 15 years of clinical experience specializing in ADHD, ASD, depression, anxiety and trauma resolution and is currently in private practice. She has a master’s degree in Counseling and a minor is English/Criminal Justice. Since the creation of her Facebook called “Healing ADHD & Asperger’s Without Hurting.” She has amassed over 100,000 weekly visitors who turn to her for guidance and support as they desperately search for help for their children. could you please help cause i have just received my daughters results that she is autism i need assistant please help. I hope you will consider reading my book Julie. It’s an easy to read – step by step guide.